Chuck Mertz: On the line with us right now: Kevan Harris, the Radical Pessimist, live from Princeton, New Jersey to tell us what’s going on in Iran and in economics around the world. How was your visit to Tehran this time? I heard you on NPR! Kevan Harris: That happened kind of randomly. It was Deborah Amos, an old NPR hand who’s been covering the Middle East since 1982—since the Israeli invasion of Lebanon. She’s mostly covered the Levantine side of things—Syria, Lebanon—so she hadn’t been to Iran in about 25 years, she told me. For her, being in Iran was very surprising. My point is that some of the stories coming out now could have been written in 1997—and were. Maybe this just has to happen so that finally people will start writing stories much more pertinent to today’s problems in Iran. CM: Do you think that ‘condescending’ is the right word to describe the way Iran is reported on? KH: ‘Condescending’ might be a little too…condescending. I think it’s the media structure in the United States. Italian journalists have been going to Iran all the time; no Italian journalist ever stopped going to Iran—no Brazilian journalist, or French. But the English-language journalism in the U.K. and the U.S. have had this block. Generally politics in Iran works through a loose consensus; there’s not one guy at the top who makes all the decisions and then the state just carries them out. There’s a bunch of players, and they rally their own sides, and then a coalition forms, and people can veto decisions, and that’s why things move so slowly in Iran sometimes. To actually report that well, you have to name names; you have to include all these players. And of course that’s too many names for an American audience, according to our editors here. Too many names! Just break it down to two. Maybe the president and one bad guy. CM: So tell us about hosting Immanuel Wallerstein in Iran. KH: Right. 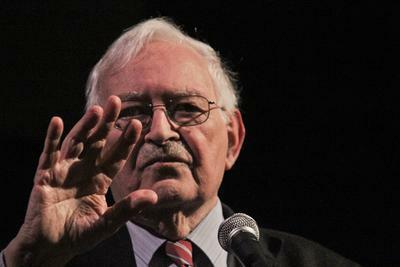 Immanuel Wallerstein is a sociologist. He is widely read in Iran: he’s been translated into Persian, he was read in the seventies before the revolution, he was read after the revolution. His name is in high school textbooks in Iran. This guy is very popular. He’s revered on all sides of the intellectual spectrum in Iran: from the conservative Right realpolitik Islamists to the radical Left to neoliberals who just like the fact that Wallerstein is famous and his coming to Iran gives Iran prestige. Anyway, after the elections he contacted me to set up a visit. I didn’t want to do it through the government, because you don’t want to come back to the United States and be accused of things. It’s a problem. Luckily the Iranian Sociological Association, which has 20 different chapters at different universities in Iran, organized the whole trip. They set up a lecture tour; they set up a conference on Wallerstein at University of Tehran. That was a day-long event—lots of different Iranian academics commenting on his work; rather famous intellectuals were there. And it was like the Beatles were coming to Iran. It was unbelievable. A thousand students showed up to see him. Everybody wanted a piece of the action: everybody wanted a picture with him, everybody wanted to ask about their own pet theory. It was far more impressive and receptive than I had imagined, even knowing that he was well-known in Iran. CM: What explains his popularity? It’s not just because he’s in textbooks. KH: No, it’s not. It goes back several decades. Wallerstein is not very popular in the United States, especially not among establishment intellectuals and establishment academics—and, unfortunately for me, establishment sociologists. And there’s a reason for that: he peaked in the late seventies in the United States. Back then, there was a far wider and more interesting debate going on about the origins of capitalism, about development—in the 1970s, the first challenges to the American role in the global economy were occurring. Not only from Japan and Germany, but also from the “Third World” itself. He took part in that debate; he produced his own theoretical works, and they resonated widely at the time. But then, with the right turn in politics in both the U.S. and in Europe (and also in scholarship itself), while I wouldn’t say he was marginalized, he definitely went off and did his own thing. However, he also resonated widely in the Third World. Why? Because he gave a different explanation for why Third World countries remained relatively poorer than rich countries, why they were not able to ‘catch up.’ In that sense he really speaks to the problems of developing countries, of middle-income and poorer countries, and it’s part of why he’s widely read in Iran. But there’s another reason why he so resonates in Iran: he not only combines all the great intellectual traditions of European and American social science, but he uses them to challenge the status quo. So he was giving this lecture in the University of Tehran; you always wonder when you hear a speech like this: what resonates with people? He was talking about how in the 1960s we had leaders come to power in lots of different countries that promised to change things, and promised to solve the problems that earlier leaders had promised to solve and failed. But these European social democrats, Communist parties, Third World independence movements: they all tended to fail at solving these problems, too. Then he said that even the new leaders replacing them generally tended to reproduce the same problems, not solve them…and while he didn’t say ‘Iran,’ suddenly people started clapping in the back of the hall. But the other reason he resonated is because he’s famous, and a famous American in Iran doesn’t happen every day. About ten years ago, before president Ahmedinejad was elected, when Mohamed Khatami was president, there was a lot of intellectual exchange going on with Iran, and it was making big headlines. You had philosophers from Europe coming to Iran and giving big—again, big—lectures, and thousands of people were showing up. And that stopped. For the last few years, it’s been an intellectual desert for people who want to get this kind of thing firsthand. That’s also why we went to Shiraz, in the south. The university there—which used to be a big, well-known university outside of Tehran—had had English as its language of instruction before the revolution. And a thousand people showed up to see Immanuel Wallerstein; they were chasing him all around the parking lot, banging on the windows. I think probably most of them hadn’t really read him or may not have even spoken English, but they wanted to see this guy. Who is this guy? Who is this American coming here? I have to see him. So people were poking their heads in, and that’s great. That’s a luxury that many of us have at universities in the United States that others don’t. It was also a very instructive experience for me. I was reminded about how academic culture in a lot of the world reminds me—although I wasn’t alive at the time—of academic culture in the United States before the student protests of the 1960s. The academic culture in Iran has all kinds of faults; the professors act like they’re gods; class participation is not a two-way street. Professors tell the students what to think, and the students sit there and memorize it. I asked the organizer if we could have more students asking questions and things like that—but the professors wanted to talk to Wallerstein. They wanted to have their pictures with Wallerstein. There was this pecking order. If I do this again with somebody else, I’m going to mandate that we set aside time for only students. But that was one of the points of this; this was a test of the intellectual waters—our government wasn’t involved, their government wasn’t involved—to see if a space can be made for this kind of discussion. And it was resoundingly successful. Next time we do this, I’m just going to try to make the exchange deeper. CM: It amazes me that Immanuel Wallerstein is so famous in Iran, and that thousands of people would be chasing him down the street like he’s the Beatles. KH: It turns out it actually happens a lot. It just doesn’t happen in the United States, so we don’t write about it. He said that in Mexico—what’s the common denominator?—in Mexico, Turkey, South Korea, these kinds of countries, he’s huge. Huge. I think he’s even huger in South Korea than in Iran, actually. Every little thing he writes is translated into Korean immediately. With Immanuel, they get a reading other than “it’s been my fault the whole time, it’s been our fault.” And there’s a dangerous thing involved with this realization. Immanuel talks about the world economy as a whole structure in itself. Countries might move up and down in this structure, but you’re not going to get all the poor countries catching up to the rich countries under the current structures of the world economy. And that’s something that mainstream economics thinks is crazy. They think if you just have the right institutions and the right policies, if you let the market generally decide and interact with the world economy, you will catch up. They would say, “look at Korea.” The problem is that in this structure you just can’t have twenty Koreas. Korea becoming Korea made it less likely that other Koreas would exist. This is the unit of analysis, larger than the simple nation-state economy. And just changing the way you view the world economy can change the way you think about history. That’s basically what he’s been saying for a long time. Pingback: 792: Eurofission | This Is Hell!